Tata Steel UK sale: Who is Sanjeev Gupta? As the sales process for Tata Steel in the UK begins in earnest, attention has been increasingly turning to the only person to publicly express an interest in buying the Port Talbot works. 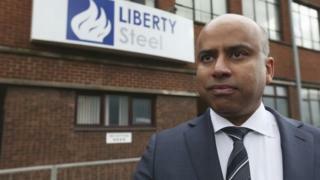 Liberty Steel re-opened the former Alphasteel plant in Newport on the day the UK government was holding its steel summit to discuss the crisis in the industry. Sanjeev Gupta, the 44-year-old who set up Liberty while he was at Cambridge University, had kept workers on half-pay while he tried to get the mothballed site operating again. They did not have to come to work and could take other jobs. But it meant he had a skilled, knowledgeable workforce ready to start when the plant was up and running again. So who is Sanjeev Gupta? Born in India, the third of four children, he said he was "born into business" trailing his father around his companies. At 14, he was sent to boarding school in Canterbury before heading to Cambridge to study economics. It was not all theory though as he started an international trading business while studying. Running up large phone bills while operating out of his student accommodation led to him being asked to find somewhere else to live by the university authorities. Liberty now has an annual income of £3.5bn and has offices in London, Dubai, Singapore and Hong Kong. Some critics have questioned his complex network of companies including those off-shore in the Isle of Man. This is unremarkable, according to Mr Gupta. What is transparent is that he has a very clear vision and it goes beyond steel. He has picked up distressed companies including Tata in Scotland and parts of Caparo Steel with the idea that they can be moulded together to create an integrated business. Sanjeev Kumar Gupta, also known as SKG, born in the Punjab, India, 1971, the third of four children. Son of Indian tycoon Parduman K Gupta, whose interests included Victor Cycles and who is now chairman of industrial and energy group Simec. Aged 11, he ran away from boarding school in the Himalayas to catch a bus home with his brother - a five-hour journey. At 14 he was sent to the UK to board at St Edmund's College Canterbury, and was described as a "bright-eyed intelligent young man" by one teacher. In his gap year, he sold bicycles for his father in Turkey. At Cambridge University studying economics and later management, he set up Liberty House trading company, once making £1m in a day. He was hauled up before college bosses for the size of his phone bill and using halls as his business address. In his early days, he traded commodities ranging from chemicals to frozen chicken feet and fish heads. He once lost £10m in one day on a sugar deal. Gupta's future wife Nicola, from Canvey Island, Essex, was his company treasurer. Although from a modern Indian family he had kept the relationship secret for seven years before it became the family's first cross-cultural marriage, in India in 2008. The couple have three children under five and moved to live in a £4.5m mansion near Chepstow, Monmouthshire. He is known as a workaholic who has only had two holidays - including his honeymoon. Despite his group having a £4bn turnover and offices in 30 countries, his wife says he "can't change a light bulb". Some concerns remain over his idea of moving Tata's Port Talbot site away from making steel from scratch to recycling from scrap. Critics argue it could lead hundreds of job losses though supporters of the idea believe those workers can be retrained. Energy is the other major industry the Gupta family has an interest in. It owns the Uskmouth power station and is hoping to develop biomass as part of plans for an energy park around Liberty's Newport site. Sanjeev Gupta also bought shares in the company behind the Swansea Bay Tidal Lagoon, with an aim of building bigger such projects at Cardiff and Newport. The idea is that making energy more affordable for all will make the steel industry more sustainable. But the UK government has been rolling back on its subsidies to renewable energy and it has launched a review over the potential benefits of tidal given its high strike price - the price guaranteed by UK ministers. I have asked Sanjeev Gupta many times why he thinks the UK government will move back to greater support of renewables. His answer has always been: "Because it has to." I spoke to him last week and he outlined his thoughts on buying Tata Steel - including saving the giant Port Talbot plant. He admitted the hot end of the works - its two blast furnaces - are the challenge, as they rely on importing raw materials from abroad. Mr Gupta's vision is around making steel from recycled scrap, which the UK has so much of, it ends up exporting it. But he is prepared to look at the economics of running the newer blast furnace number four - rebuilt only three years ago at a cost of £185m - while building a new electronic arc furnace to melt down scrap for steel. "In the short term, probably we might only close the old blast furnace and keep the other one going and optimise it," he said. "You can't build furnaces overnight; to build an arc furnace will take at least two years. If the economics for the arc furnace are compelling we'd shift the other one as well. It would be a step by step approach." "Maybe there will be a possibility [the blast furnace] is sustainable. But instinctively I find it difficult because you're importing all your raw material from far-flung parts of the world rather than using material which is domestically available, but it's worth analysing." Mr Gupta said he had been given assurances from Welsh Government it would help with the cost of retraining blast furnace workers during any transitional phase. In terms of jobs, he said Liberty's culture was not to take on businesses which need to make big job losses and a "very, cursory look suggests there isn't a need for any major changes". Mr Gupta said he ran his medium-sized operation like a small company - "we're young, agile, able to make quick decisions". It includes former senior Tata people, who will help as he examines the detail. But in this instance, Mr Gupta warns the timescale will be months and that a deal within weeks would be "absurd". "You couldn't conclude the acquisition of all of British steel within four weeks no matter what you try to do," he added. "But the point is you'll go through certain hoops and hurdles and you'll come to a point when a deal is in the making and then you will have a few months to conclude it." Obstacles include the £500m deficit in Tata's pension scheme. "It's obviously a clearly identified issue which needs to be addressed but we need to spend some time and expertise on analysing what the implications and what the options are," he said. "Everyone is aware it's an issue and I believe there will be a resolution." Sanjeev Gupta's first song at his wedding was Kenny Rogers' The Gambler. His wife said of Tata: "It's a gamble but hopefully a calculated gamble." With his positions on energy and Tata, Mr Gupta may be a bit of an educated gambler himself. Who might save Tata Steel in Port Talbot?